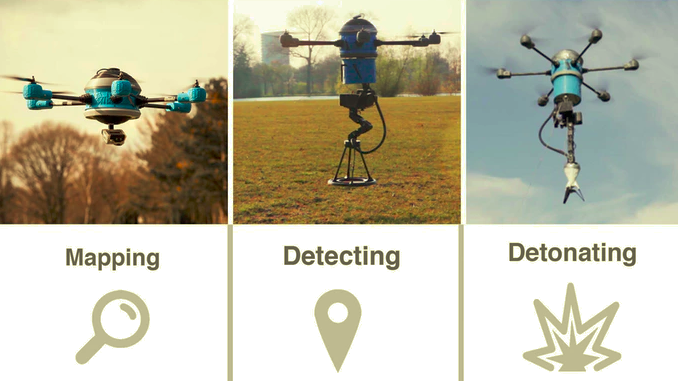 The Mine Kafon Drone (MKD) is an autonomous device capable of mapping, detecting, and ultimately detonating land mines. While there are an estimated 100 million lands mines around the globe, the creators behind the Mine Kafon Drone believe its possible to rid the world of these deadly land mines in approximately 10 years’ time. Designed by Netherlands-based Massoud Hassani, the Mine Kafon Drone works autonomously and utilizes three separate interchangeable robotic extensions in order to detect and detonate land mines from a safe distance. Thanks to GPS waypoints, the Mine Kafon Drone can can hover over mine locations and then release a detonator with a timer that can dispose of the deadly land mines. I highly suggest checking out the MKD Kickstarter page and at least reading more about its mission to rid the world of land mines that are currently hidden beneath the sands in 60 countries around the world.